Our laboratory has an accumulating body of research suggesting that alcohol and other drug use is accompanied by changes in stress responses to uncertain (but not certain) stressors. Such “neuroadaptations” of the brain’s stress response system are important in addiction because stress is known to lead to relapse in humans and animals (‘stress-induced reinstatement’). Neuroscientists have demonstrated that heavy drug use is also accompanied by changes in the brain’s reward centers and associated decision-making. Potential neuroadaptations of reward centers are also important in addiction because they can change the way people make decisions about future drug use (a ‘certain’ reward) or pursuing alternative goals like education and employment (the ultimate outcome of which is relatively uncertain). Our findings of drug-induced changes in stress responses to uncertain stressors led us to wonder if drug users also experience changes in the reward domain, such as in their preferences for uncertain (vs. certain) rewards. Specifically, we tested the hypothesis that marijuana deprivation would lead heavy users to disproportionately prefer monetary rewards of known values over uncertain rewards (e.g., those with a 50-50% chance of getting one out of two possible dollar amounts). We asked heavy marijuana users to either abstain for 3 days or to continue their normal rate of use. Participants then completed a reward decision-making task in which they chose between certain and uncertain rewards. 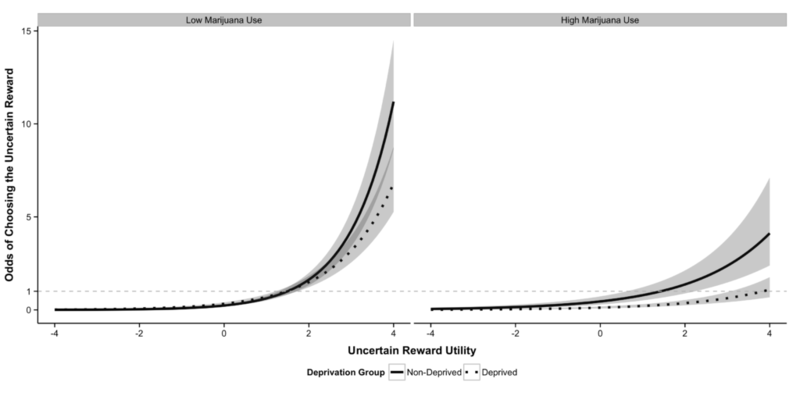 We found that deprived marijuana users (red line) preferred certain rewards with known dollar amounts over uncertain rewards with a 50-50% chance of getting one of two possible dollar amounts more than non-deprived users (green line). This was particularly true when the uncertain reward was actually a better ‘deal’ than the certain reward (Uncertain Reward Utility values over 0 means the uncertain reward is a better ‘deal’). We also found that the more marijuana participants smoked weekly, the more they preferred certain rewards. These results provide important evidence that heavy marijuana use is associated with changes in reward-related decision-making. This has relevance to problems with decision-making experienced by individuals struggling with marijuana addiction and can help us to better target treatments to address problems with discerning the value of different types of rewards. For example, our results suggest that a heavy marijuana user experiencing withdrawal might underestimate the value of an uncertain reward like getting a college degree.